Ikea is known for bequeathing indecipherable Scandinavian names to its wide variety of home furnishing products. Black metal is a genre that contains a multitude of bands with equally indecipherable names. Now there’s a place to test whether you can tell the difference between a decorative horse sculpture and a band that frequently plays shows while covered in blood. 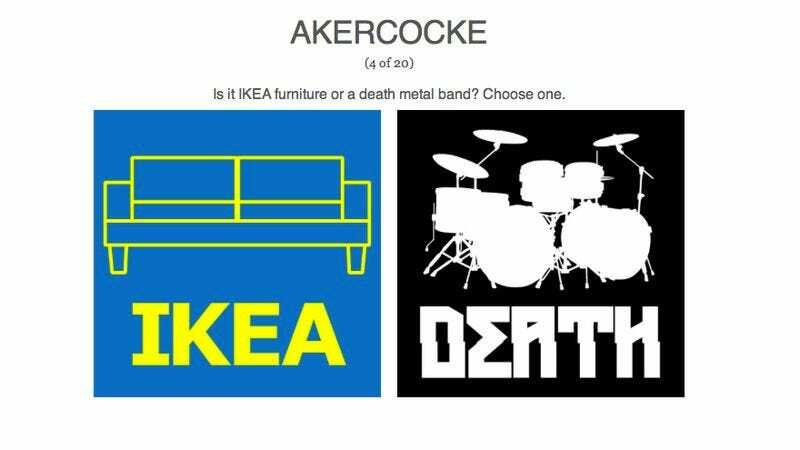 Ikea Or Death is a simple 20-question quiz that will reward your intricate knowledge of a metal subgenre or the Ikea catalogue, or confirm that all Scandinavian words sound the same to Americans. All it needs are links to purchase the items on Ikea and previews of the metal tracks and it could be an ingenious advertising partnership for anyone who wants some headbanging music while hastily putting together a fiberboard dresser.